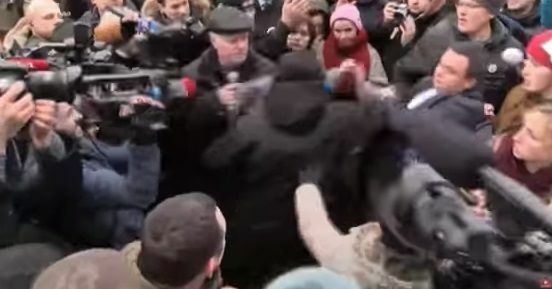 Head of the Kyiv region’s Police Department Dmytro Tsenov was attacked at a rally outside his headquarters as activists were voicing demands for the thorough investigation of the murder of a local lawyer and human rights defender Iryna Nozdrovska, 112 Ukraine TV channel reported. Responding to an attempt by some protesters to punch the police chief who came out of police headquarters to speak with the activists and hear the demands, Head of the National Police of Ukraine Vyacheslav Abroskin said that he condemned such actions. "Citizens, come to your senses! What do those count on who allow themselves beating a police chief, the one who is then to set up and control police efforts aimed at solving the murder?" he wrote on Facebook. Read alsoHuman rights activist Nozdrovska found dead in river outside Kyiv after death threatsAs UNIAN reported, several hundred people demanded from the police of the Kyiv region to transfer the murder case to the metropolitan police, expressing their distrust in the regional police department.